I hope you're having a lovely day so far. Being a second year university student I know the exact feeling of walking into university on your first day as a fresher and not feeling at all prepared. Been there, done that. There's always this part of me that has to feel 100% prepared for absolutely everything and education is my biggest weakness for this. 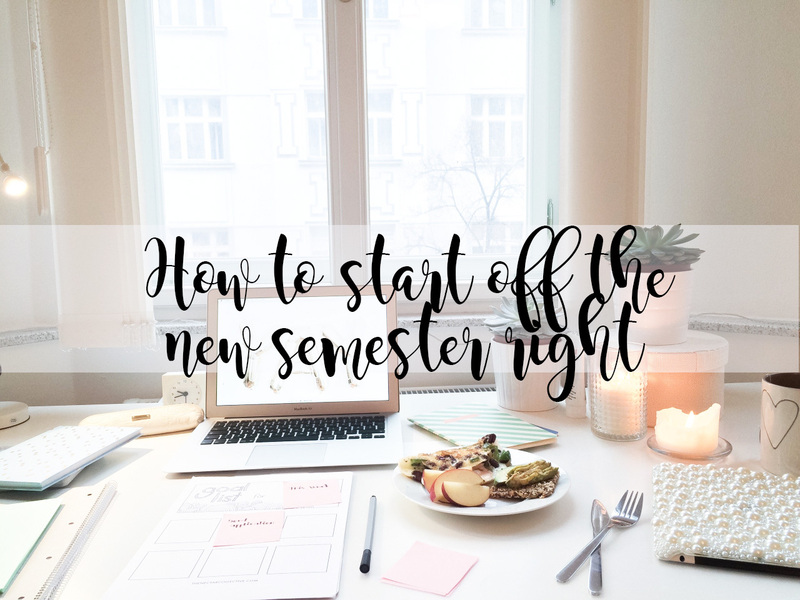 Today I am going to providing you with my top 5 tips on how to start off the new semester right. This is for everyone, not just you freshers! If you're in your 3rd or even 4th year of University, these tips will help you too, if you're still struggling with their anxiety of new semesters. Throw everything onto your bed, make lists, and do whatever you need to do to make sure you have everything together. Make sure you have the correct books, a notepad and all of your stationery. Do you have a pen that works? Do you have papers so you don't have to steal some off the person next to you? Make sure you have everything and put it all into your bag ready for the first day back! One thing many students don't bother doing is reading the module guides, seeing what the content is of the module and reading the books which are suggested on the reading list; yet this is the most important thing to do. How else are you going to know what your module is about without finding out by reading the module guide which your lecturers give you?! It fascinates me how many people just don't do this. You're not given a module guide and a reading list just to have with you and do nothing with; make use of it! Have you been to Poundland and bought your new gorgeous planner? Make use of this. Start writing in all of the days which you're in/not in, teacher training days, deadlines, holidays. Just throw everything into your planner and colour code it! Use your planner the way it should be used and use it till your hearts content! Planners are absolutely brilliant for keeping all them important dates to hand, as well as keeping track of your progress. This is something I have planned for before I go back to University; meeting up with the girls. Seeing your friends, grabbing a coffee and having a good old chinwag is the best way to start of the new semester right, you'll feel excited to see them again when you say goodbye, and it will put you in the best mood for going back to University! All I can say is, prepare! If you're not organised, then be organised. If you leave everything till the last minute, don't be silly; do it all now before it's too late! Prepare for the new semester and everything will fall into place. What are you not looking forward too about going back to University? These are all really useful tips, thank you! I'm going into my final year and really nervous about it after coming back from a year abroad, but I think as long as you make sure you're prepared then it should all go smoothly! Great post and I hope your term has started off well! I'm not even at university anymore but that can still help me start off my self-studying! So handy! Thank youuu!! Ahhhh this makes me miss being a student so much! I loved starting a new semester with new stationery and being all organised! I am post grade, and in my second uni degree. I fail to organize my planner, plus the dates and due dates always change which drives me crazy!! I really loved your last point, but as a big adult colleuges don't do this effort of meeting. Which leads me to my least favorite that I don't look forward to.. Meeting my colleuges.